My name is Fr. Lucio Villalobos Franco, MSpS. I am 46 years old and was born in Colima, Colima, Mexico on May 17, 1972. I am the son of Mr. J. Rosario Villalobos Hernández and Mrs. Esperanza Franco Chavez (+) and have 9 siblings. I entered the Congregation of the Missionaries of the Holy Spirit on June 24, 1993 and started my novitiate on September 14 of the same year. I made my First Religious Profession in St. Maria Goretti Church in Long Beach, Ca., on July 29, 1995. After seven years of my religious profession I made my Final, or Perpetual, Vows with the Congregation of the Missionaries of the Holy Spirit in September of 2002, at the church of Padre Serra in Camarillo, California. A year later, in November 2003 I was ordained as a Transitory Deacon along with my classmates from St. John Seminary in Camarillo, California. I did my Diaconate Internship at Our Lady of Guadalupe Church in Oxnard, California. After my internship in Our Lady of Guadalupe, in that same church, I was Ordained to the Priesthood on July 3, 2004. Our Lady of Guadalupe Church was my first assignment and I remained there for 2 years. From 2006 - 2012 I was Formator in the Novitiate-Seminary of the Missionaries of the Holy Spirit. From July 2012 - December 2013 I was the Superior and Rector of the Saint Joseph House of Theology in South Bend, Indiana. From January 2014 - June 2017 I was Pastor and Superior of Our Lady of Guadalupe Church in Oxnard, California. In July 2017 I entered the Doctorate Program at the Oblate School of Theology in San Antonio, Texas. 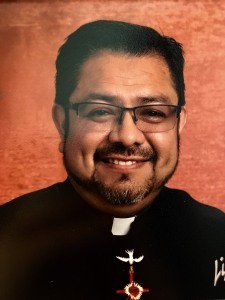 In July 1, 2018 I was assigned by my Provincial Superior and his Council as Parish Administrator of St. Matthew Catholic Church in Hillsboro, Oregon.